Position: bright but not in full sun Soil: moderately fertile, well-drained soil or in loam-based compost, such as John Innes no2, with additional leaf mould and sharp sand Rate of growth: average Flowering period: September to November Hardiness: tender The rich red flowers of ‘Benfica’ can be used to lend seasonal colour to the Christmas festivities, but it also looks pretty amazing at other times of the darker months of the year. A great gift idea, these bulbs are easy to grow and give lots of pleasure. 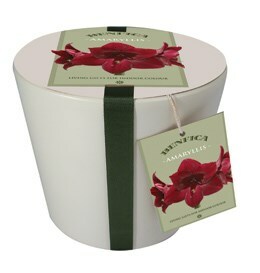 The gift set includes a ceramic pot, compost, one amaryllis bulb and growing instructions. General care: Before planting make sure the supplied compost is moist but not waterlogged. Place half the compost in the pot and then sit the bulb on top (pointy side up). Fill in with the remaining compost so the upper third of the bulb is exposed. Water sparingly and place in a bright, warm position (indoors). Keep the compost moist but not waterlogged at all times and rotate the pot every so often to keep it growing straight. The stem may need support when the flowers start to bloom. Once flowering has finished cut off the flower stalk 5-10cm above the bulb – don’t cut off the foliage. Water when the surface of the compost is dry and feed regularly with a balanced liquid fertiliser. Usually the best thing to do is keep watering it through the summer and in autumn stop watering and move to a dark, dim spot. This stimulates the drought season of the plant’s native South America. Allow it to dry out for a few months so that the foliage wilts and dies back. In November bring it back in to the light and start watering again. Old foliage should be removed though take care not to cut any new shoots off. In a few weeks a new flower shoot will appear and flower just in time for Christmas. Position: bright but not in full sun Soil: moderately fertile, well-drained soil or in loam-based compost, such as John Innes no2, with additional leaf mould and sharp sand Rate of growth: average Flowering period: September to November Hardiness: tender Easy to grow and fantasticly showy plants when in flower, amaryllis make great gifts for both the novice and more experienced gardener. ‘Dancing Queen’ has unusual flowers with lots of petals, each streaked with salmon pink. 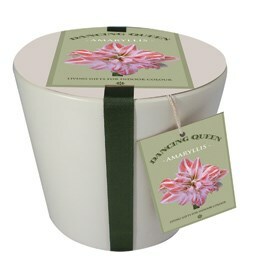 The gift set includes a ceramic pot, compost, one amaryllis bulb and growing instructions. General care: Before planting make sure the supplied compost is moist but not waterlogged. Place half the compost in the pot and then sit the bulb on top (pointy side up). Fill in with the remaining compost so the upper third of the bulb is exposed. Water sparingly and place in a bright, warm position (indoors). Keep the compost moist but not waterlogged at all times and rotate the pot every so often to keep it growing straight. The stem may need support when the flowers start to bloom. Once flowering has finished cut off the flower stalk 5-10cm above the bulb – don’t cut off the foliage. Water when the surface of the compost is dry and feed regularly with a balanced liquid fertiliser. Usually the best thing to do is keep watering it through the summer and in autumn stop watering and move to a dark, dim spot. This stimulates the drought season of the plant’s native South America. Allow it to dry out for a few months so that the foliage wilts and dies back. In November bring it back in to the light and start watering again. Old foliage should be removed though take care not to cut any new shoots off. In a few weeks a new flower shoot will appear and flower just in time for Christmas. Position: partial shade Soil: heavy, neutral to alkaline soil Rate of growth: average Flowering period: February to April Other features: all parts of the plant cause severe discomfort if ingested; the sap may cause skin irritation Hardiness: fully hardy Pink-flushed, white flowers that are attractively freckled with maroon, appear from late winter. Perfect for adding colour to the woodland floor, or for adding early interest to the front of a mixed border, hellebores are in flower at a time of the year when little else is. This means that not only do they add interest to the garden, they also provide a valuable source of nectar to foraging insects. Garden care: Add lots of well-rotted leaf mould or organic matter to the planting hole. Cut the old leaves back down to the ground in January or February as this will show off the new emerging flowers to best effect. 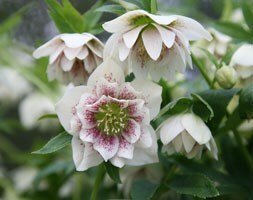 It will also help to get rid of foliar diseases such as Hellebore leaf spot. Apply a generous 5-7cm (2-3in) mulch of well-rotted organic matter around the base of the plant in autumn and provide a top-dressing of general fertiliser each spring. 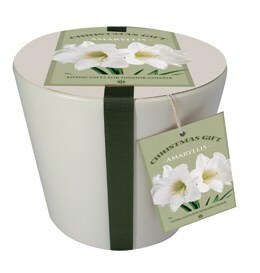 Gift set includes ceramic pot, compost, a amaryllis bulb and growing instructions. Position: bright but not in full sun Soil: moderately fertile, well-drained soil or in loam-based compost, such as John Innes no2, with additional leaf mould and sharp sand Rate of growth: average Flowering period: September to November Hardiness: tender Amaryllis make a great gift for a green-fingered friend (or even those that are just starting out). They are easy to grow and this kit includes everything you will need including one bulb, a pot, sufficient compost and full instructions. Hippeastrum ‘Christmas Gift’ has slightly ruffled, creamy white petals with a green-flushed eye, which form sumptuous trumpet-shaped flowers in winter. General care: Before planting make sure the supplied compost is moist but not waterlogged. Place half the compost in the pot and then sit the bulb on top (pointy side up). Fill in with the remaining compost so the upper third of the bulb is exposed. Water sparingly and place in a bright, warm position (indoors). Keep the compost moist but not waterlogged at all times and rotate the pot every so often to keep it growing straight. The stem may need support when the flowers start to bloom. Once flowering has finished cut off the flower stalk 5-10cm above the bulb – don’t cut off the foliage. Water when the surface of the compost is dry and feed regularly with a balanced liquid fertiliser. Usually the best thing to do is keep watering it through the summer and in autumn stop watering and move to a dark, dim spot. This stimulates the drought season of the plant’s native South America. Allow it to dry out for a few months so that the foliage wilts and dies back. In November bring it back in to the light and start watering again. Old foliage should be removed though take care not to cut any new shoots off. In a few weeks a new flower shoot will appear and flower just in time for Christmas. 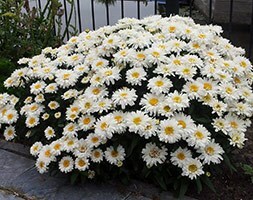 Position: full sun or partial shade Soil: moist, fertile, humus-rich soil Rate of growth: average Flowering period: July to September Hardiness: fully hardy Recently bred in Japan, this new cultivar has a compact habit, which means it does not need staking and will stand up well in poor weather conditions. The flowers appear in abundance, adding colour to pots or borders in late summer and autumn. Garden care: Cut back the stalks after the flowers have faded. Tidy up old dead leaves in March. Apply a generous 5-7cm mulch of well-rotted garden compost or manure around the base of the plant in spring. Avoid moving the plant since it resents disturbance. Where necessary lift and divide congested clumps in early spring. 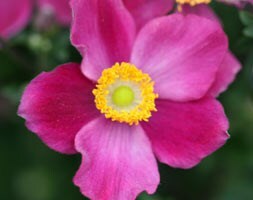 Position: full sun Soil: moderately fertile, moist but well-drained soil Rate of growth: average to fast Flowering period: June to September Hardiness: fully hardy Appearing over a long period from early summer, the anemone-centred flowerheads of this delightful new perennial have a somewhat ruffled appearance. Its compact habit, makes it suitable for patio pots as well as the front of a sunny border. Garden care: Divide congested plants in early spring or late summer. Protect young plants from slugs and snails. Cut down to the ground in autumn. Position: full sun Soil: any fertile, well-drained soil Rate of growth: average Flowering period: July and August Hardiness: fully hardy In July and August, whorls of tubular, lilac flowers appear at intervals like fluffy beads, on erect stems held high above large, downy leaves. Even after the flowers fade, this plant retains a dramatic presence in the border, with architectural seedheads that look wonderful among late-flowering perennials and grasses. This is a versatile, robust perennial that can cope with drought and is equally at home as part of a cottage-garden scheme or among silver leaved plants and ornamental grasses. Garden care: In mid-spring shorten any frost-damaged stems, cutting back to just above a healthy bud. Remove any weak or diseased shoots, cutting cleanly back to the base. 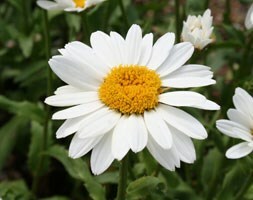 Position: full sun or partial shade Soil: moderately-fertile, moist but well-drained soil Rate of growth: average Flowering period: June to September Hardiness: fully hardy Justifiably popular, this showy shasta daisy produces a profusion of single, pure white, daisy-like flowers up to 10cm across with bright yellow discs from June to September. It is very free-flowering and makes a stunning show planted in bold drifts towards the front of a sunny border. It combines well with any yellow Achillea, or with ornamental grasses. It also makes a good cut flower. Garden care: Divide congested plants in early spring or late summer. Protect young plants from slugs and snails. Cut down to the ground in autumn. Position: full sun or partial shade Soil: fertile, moist soil Rate of growth: fast-growing Flowering period: July to October Hardiness: fully hardy Phlox have always been country garden favourites for their delicious scent and attraction to butterflies and bees. 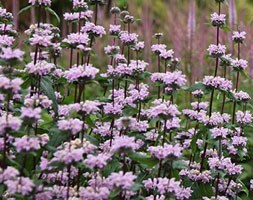 This variety bears large trusses of flowers from July to October on tall stems with narrow, toothed, mid-green leaves. This long-flowering, vigorous perennial will tolerate full sun or partial shade, but like all phlox, does not like soil that dries out in summer. Try it in the middle of a border as part of a deep blues and purple colour scheme. The stems need supporting in spring before the flowers appear. Garden care: Support with bamboo canes, brushwood or ring stakes before the flowers appear. 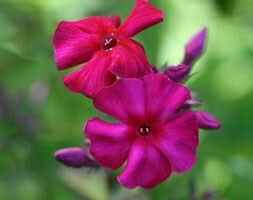 Phlox are greedy plants, so apply a mulch 5-7cm (2-3 in) deep of well-rotted garden compost or manure in early spring. Shear off the spent flowers to prevent reseeding. If the leaves show signs of powdery mildew , cut down to the ground and dispose of the affected foliage, but do not compost it. Clear away the debris around the plant to reduce the chances of reinfection. Cut down to the ground in autumn. Lift and divide large clumps in autumn and spring.